The major categories are: Korea Kent Foreign School, U of Kentucky, COETAIL, Google, PD events, Seoul Foreign School, and social media. Korea Kent Foreign School (KKFS): I work at KKFS. It’s a very small K-12 foreign school in Seoul, South Korea, which has a very diverse population. I don’t think there is one native English speaker in the student body of roughly 260. EdTech committee: I’m on this committee, and despite the size of the school, there are some very good people on the committee who are happy to share their knowledge and experience, and work on finding solutions to fix issues, provide services, educate the teaching and admin staff, and brainstorm in order to anticipate and plan for needs. I hardly know everything and definitely can’t do all of it, but together the EdTech committee members can come up with some excellent, creative ideas for making technology work for everyone at the school. We’re constantly learning from each other. Other teachers: I’m one of the school’s tech coaches (as are the other members of the EdTech committee), but I enjoy solving problems with technology, and I’m happy to listen to any and all of the other people on staff to see if we have technological solutions for them, and then train and coach them on those solutions. I want to be the technology resource person on campus who keeps up with all of the latest stuff, separates the wheat from the chaff, and can figure out how to best meet the needs of the staff and students with the resources available. The other teachers are helping me to become a better coach, even if they don’t know it. Seoul Foreign School (SFS): My wife (it was 5 years on 12/26!) is a highly educated and experienced EAL (English as Another Language) teacher who taught for 20 years in the US and has been teaching for 6 years at SFS in the ELL department. Because of our relationship, I’ve gotten to know not only some of the people at SFS, which is a large, tier 1 school, but also some of the challenges the school faces and how the IT/DLC staff is meeting them. I’ve been able to attend some of their informal PD and talk with the school’s DLCs. COETAIL: Between the faculty, alumni, current students, and future students, COETAIL is a critical resource to help me become a great technology coach. U. of Kentucky: I made the U of Kentucky bubble white because I haven’t started classes with them yet, but I’m working on my application. I’m starting on a M.Ed. in Educational Leadership this summer or fall, and the same types of networking qualities that apply to COETAIL also apply to the U of Kentucky. Social media: At this point, Twitter seems to be a much more important resource for staying in touch with the EdTech community than Facebook. Google: I’m a Level 1 and Level 2 Google Certified Educator and I’ve coached about eight people at KKFS through the Level 1 exam. That experience definitely made me a better coach. It would be interesting, fun, and exciting to become a Google Trainer. Personal development (PD) events: I’ve been to 2 KORCOS conferences so far and I’m sure I’ll be going to a few more in the future. I’d like to be a presenter and a participant next year (See “How can I join?/Ongoing requirements” on the Google for Education Certified Trainer Program page. 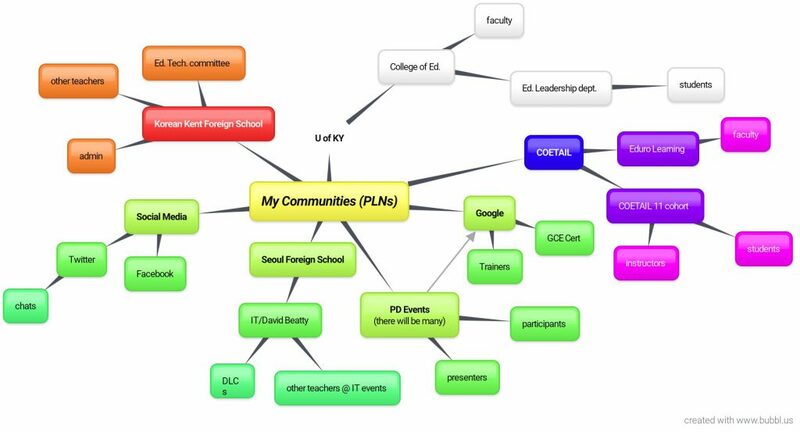 ), which will definitely be good preparation for transitioning into a bigger EdTech role. Previous Let’s get this (COETAIL) party started! Now I know who the IT director who recommended COETAIL is 😉 Ironically, I was just looking at his COETAIL final project today and sharing it with the Online 10 cohort! I appreciate living in a community that has many different schools so we can all learn from each other. I figured you’d know David. He highly recommended the program and I think at least one of his DLCs has taken or is taking COETAIL courses.